Better details, easier access to actions. We just released a new minor update with an improvement of the tournament detail dialog. It is now easier to access to the actions available. The new tournaments derailed display. If a web address is provided, you can view the website. The app will launch the default web browser or ask you to choose one, and will open the web page. If a city is provided for the tournament, you can locate it on a map. The app will launch your default map app or ask you to choose one, and will rely on the search capacity of that app to locate the city. If a web address is provided, you can also share a tournament with your friends. The app will let you choose among the apps which can handle text messages (SMS, emails, instant messaging...). If you are running any version prior to the 1.6, those actions are available trough a long press on the tournament element on le list view. A menu offering the available actions will pop up. 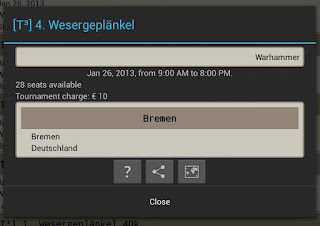 The location action is also available trough a tap on the place block on the tournament detail dialog. Those interactions are still available, but we think that a long press is not a nice way to interact with the device. So, we added a few buttons one the tournament detail view. Any button will be displayed if the action is available. Of course, for T3, they are usually all available. As images on buttons may not have an obvious meaning, you can just long-press on those buttons to display what their action is. Feel free to give your opinion in the comments, we would love to read your feedback. After a long black out, we are back on this app. We have plenty of ideas about the MiniWar Tactical Companion and finally managed to find time to work on them. The last release is one year old, and it is pretty difficult to really make the old app evolve to today's standards. Our main concern is to avoid any data loss or to introduce any harmful regressions. So we checked the app usage and it appears that only a few used the app to schedule some personal tournaments, and your main activity is checking Table Top Tournaments feeds. We understand that the personal tournament page does not provide any feature that a calendar entry would. So we decided to put that aside for now and focus on how to discover new tournaments. How to make the app better on that point. We just released an update of the app which now focus on T3 feeds. Stating the app will now display the International feeds. As previously, you can check the other feeds (and the bug for the US have been corrected) or filter by a gamesystem. If you are using the Alkemy Companion app, it will still open the Tactical Companion T3 feeds filtered for Alkemy gamesystem. Improvements will come fast. But if you have any ideas or wishes for the evolution of the app, feel free to tell us about it on the comments. You can download the MiniWar Tactical Companion from Google Play.